A Netflix error message tweeted by the journalist and developer Yuri Victor. Netflix has begun displaying messages for users whose videos are slow to load that blame Verizon (VZ) and other Internet service providers for the problem. It's the latest development in the streaming service's battle with the country's largest ISPs. Verizon responded Thursday with a cease-and-desist letter calling for Netflix to stop displaying the message, calling it "deceptive" and threatening legal action. 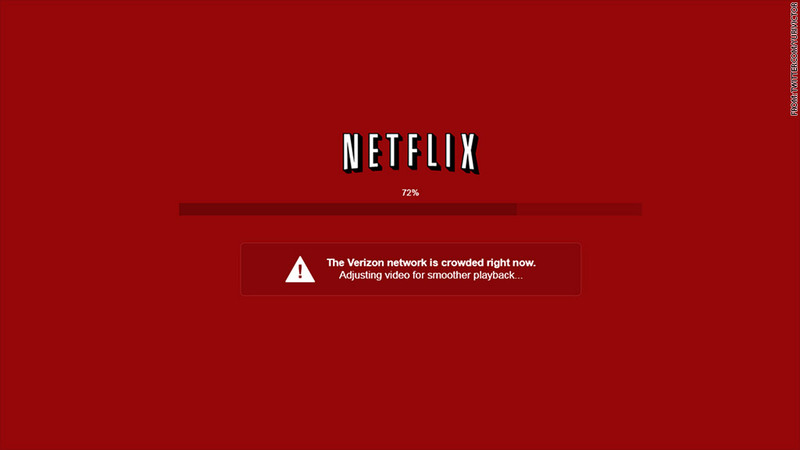 The issue came to public notice earlier this week after journalist and developer Yuri Victor tweeted a Netflix error message reading: "The Verizon network is crowded right now." Netflix (NFLX) spokesman Joris Evers confirmed that the company is "testing ways to let consumers know how their Netflix experience is being affected by congestion on their broadband provider's network." AT&T (T) users have received similar messages, Evers noted. Netflix's dig at Verizon comes despite the fact that the two companies reached an agreement in April in which Netflix will pay to boost streaming speeds by connecting directly to Verizon's network. This connection apparently isn't yet being used for all the traffic Netflix sends to Verizon, however. Related: Time to buy or sell Netflix stock? 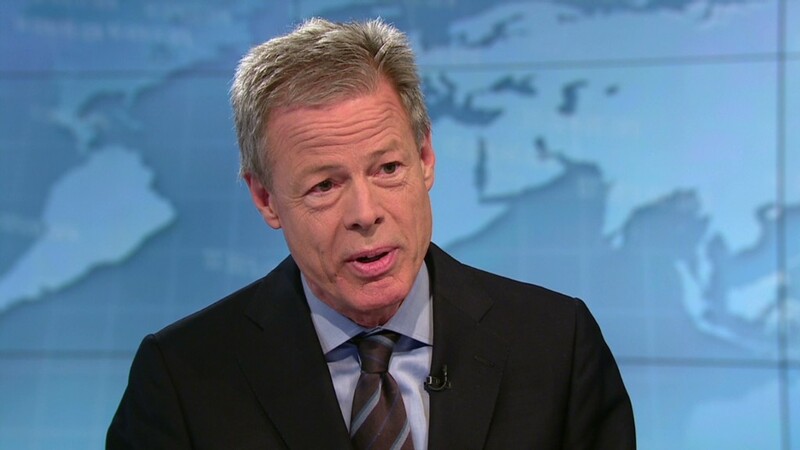 "I sincerely hope this is not a harbinger of things to come in terms of how Netflix treats its network partners and our mutual customers," Verizon executive vice president Randal Milch wrote in his letter to the streaming service. Netflix's Evers, commenting on the Verizon letter, said that "this is about consumers not getting what they paid for from their broadband provider." "We are trying to provide more transparency," he added. Netflix struck a similar connection deal with Comcast (CMCSA) in February. The company says it struck the deals with Verizon and Comcast "reluctantly," accusing the ISPs of abusing their market power to extract a toll for content their customers have already paid for. But the ISPs tell a very different story. They point to the fact that Netflix generates a massive amount of data consumption -- around a third of traffic online during peak hours -- while sticking them with the costs of upgrading their infrastructure to handle the ever-increasing flows. In a separate blog post from Verizon on Wednesday, the company said the error message displayed in Victor's tweet "is not only inaccurate, it is deliberately misleading." "It would be more accurate for Netflix's message screen to say: 'The path that we have chosen to reach Verizon's network is crowded right now,'" Verizon vice president David Young wrote in the blog post. "However, that would highlight their responsibility for the problem." Netflix still delivers much of its traffic to ISPs via third parties like Cogent Communications (CCOI). The ISPs then transmit the content on the last leg of its journey into your home. But Netflix now has the ability to bypass third-party transit providers through its direct-connection deals with Comcast and Verizon. The agreements followed several months of declining streaming speeds for Comcast and Verizon users, which Netflix CEO Reed Hastings has called a deliberate move by the ISPs to force Netflix into paying them. The heart of the problem is that high-speed Internet networks are extremely expensive to deploy. There aren't many companies with the resources to do it, and there isn't enough competition in most regions to push ISPs to quickly upgrade their infrastructure. Paid-connection deals are part of how the broadband industry wants to address this issue. "It's simply not fair for Mr. Hastings to demand that ISPs provide him with zero delivery costs -- at the high quality he demands -- for free," AT&T vice president Jim Cicconi wrote in a blog post earlier this year. Other big tech companies, including Microsoft (MSFT), Google (GOOGL) and Facebook (FB), already have paid-connection deals with big ISPs. Netflix, meanwhile, already connects directly for free with some smaller ISPs like Cablevision (CVC), as well as a number of international providers.